James Forrest and Callum McGregor got the goals. 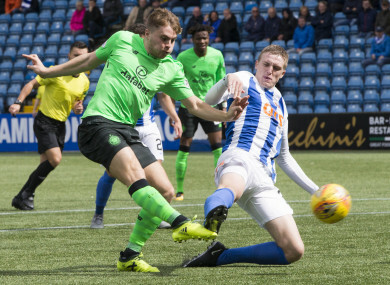 Forrest on fire: Iain Wilson tries to block Celtic man. CELTIC CONTINUED THEIR perfect start to the new Scottish Premiership season with a 2-0 win against bottom of the league Kilmarnock. James Forrest opened the scoring in the 40th minute, and although it took until the 88th minute for Callum McGregor to make the points safe, the champions never looked to be in any danger. Kilmarnock, who have now lost three from three and scored just one goal, did not register a single shot on target. St Johnstone, Hibernian and Aberdeen can all keep pace with Celtic at the head of proceedings when they kick off at 3pm on Saturday. Email “Celtic's perfect start continues with comfortable win against Kilmarnock”. Feedback on “Celtic's perfect start continues with comfortable win against Kilmarnock”.